Yesterday, my favorite Potato & I were able to get out on the town on our own (sans kids) for a few hours while my mom watched the kids. More about that here. Let me tell you, we don't mess around! How much can you get done in 3 hours & 40 minutes? Pick up present for babysittin' Memaw-check! I have been toying with the idea of getting bangs for weeks now. This should give you an idea of what kind of person I am. I plan my outfits a week ahead. I fold my underwear. And I deliberate about getting my bangs like it's buying a home. I can be fun, I promise. Thankfully, I have my good friend around to berate me into making decisions when I'm being fickle. Thanks Beck! End result... I really should have done it long ago because it turned out perfect. 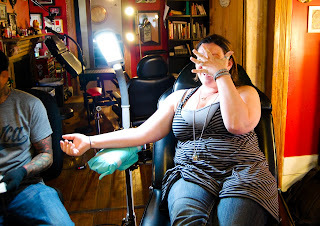 After I endured the life-changing process of getting bangs (sarcasm) we headed over to the nearest tattoo shop to try to get Becky in for some impulsive ink. I'm sure she'll blog about her own tattoo (won't you Beck) but I will share one photo. Overall, it was a FANTASTIC day. I really love the time I get with my friend. She inspires me, makes me laugh & just seems to "get me". Oh did I mention she's moving in 3 months? Mucho amor para el ya. Had a blast yesterday! We MUST do it at least once more before moving day. Wow! May your friendship stays like this forever. God bless you both.Friends are really awesome to be with. When forget every problem when they are with us. I have 4 friends who are extremely close to my heart. They were with me at every phase of my life whether good or bad. I was so depressed when my father passed away and they brought me back to my life by care and love. The most wonderful thing about them is they love me even though I am little stubborn and moody at times. They do not get angry with me when my mood is not good. Instead they tease me and try to cheer me up. I feel food when I see it. They never scolded me for being sad. Moreover they stay with me leaving all their works behind. I am a kind of person who fears for every small thing. They give me will power to overcome the situation. Go for best essay writing service here. Friends are truly important in everyone’s life. My friends were ready to fight for me whenever I had to face issues. Challenges were silly for them if it is for me. We fight together for what we believe in. when we are scared to do something, we make a plan. We try to change what is happening. Why should we scare? If we know that we are in right way, we go together to achieve our dreams. We encourage us to achieve the dreams of each one. I had another problem of being toxic at times. They showed me that every situation cannot be handled if I behave toxic. They advised me about what I do wrong and how I should be at that moment. I can say that they made me a better person. True friendship is a pure relationship which does not demand anything and just being with each other.